Le cinéma du futur est à Šamorín, au bord du Danube, en Slovaquie. Et on le doit au designer Michal Stasko. Imaginez un cinéma ultra ludique où les sièges seraient des Fatboys, où les murs seraient colorés et où visionner un film s’apparenterait à une vraie expérience. Ce cinéma existe. C’est le cinéma Tuli, conçu par Michal Stasko et situé en Slovaquie. 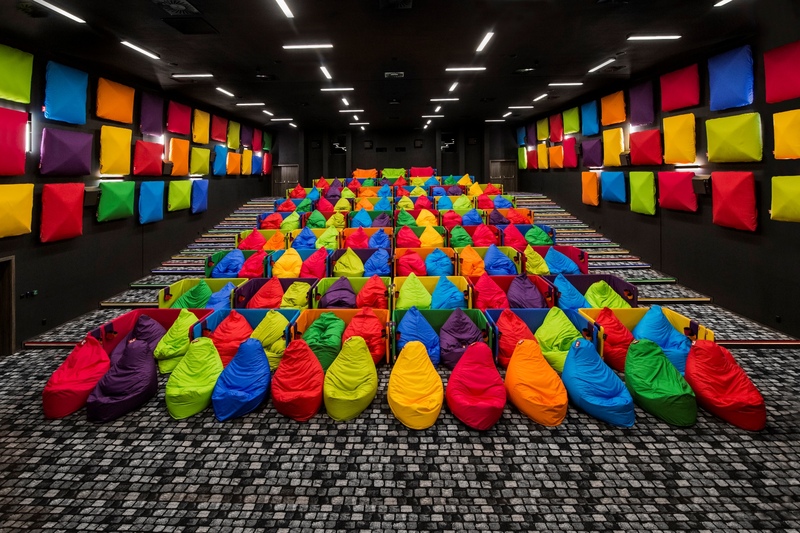 The unique Tuli® Cinema with its original design is the first of its kind in Slovakia. Its colourful styling and exceptional architecture will cheer up the visitors right away. The customized theatre is equipped with untraditional and comfortable seating by Tuli®, which was tailored to the spectators’ needs. The extraordinary experience, which in Slovakia can be only found in our Tuli® Cinema, is enhanced by state-of- the-art technology and audio system in a movie theatre with a seating capacity of 112 people. Apart from the newest movies and favourite animated movies for the whole family, we are planning private screenings and projections, as well as made-to- order events for clients. The movie screenings are scheduled regularly from Friday to Sunday in fixed times, with an emphasis on both Slovak and Hungarian language versions.